Replenishing your mind and body, restoring you to your best self, and improving your health and everyday performance. Hydration is vital for maintaining wellness and performance. Our IVs dispense essential fluids and nutrients into the bloodstream, activating cellular absorption. A single hydration treatment takes about an hour to administer. If you’re feeling dull and depleted, hydration therapy can instantly revive you. You may feel a slight pinch when the needle meets your skin, but most people report little to no pain. You can take a nap or browse social media while the infusion is underway. Dr. Nuqui has assembled a team of licensed medical professionals to ensure your experience is comfortable and sanitary. Looking for IV hydration therapy in California around Big Bear Lake? Look no further! Our mission statement is reflected in our motto above and it is what we always strive for whenever you come into our one-of-kind and relaxing IV Hydration Therapy and Wellness Clinic in certain cases when you may be sniffling and whimpering through a mild cold and flu with or without nausea and vomiting, the “runs” from a bug that you unfortunately caught after consumption of contaminated food, had a bit of a hangover from the once-in-a-lifetime party or special occasion you gladly experienced the night before, a competitive athlete who needs to boost their performance and recovery with IV hydration post-intense workout, or just worn out because of a red-eye jet lag and you have not had the chance to drink enough water and nutrients throughout your busy schedule and the days work. These are small but prime examples of different types of sometimes unavoidable life occurrences which may not be averted entirely and may probably lead to your mild to moderate dehydration and the sequelae of uncomfortable signs and symptoms stemming from the lack of daily oral water and vitamin intake. It is, therefore, only merited that our sole mission is to commit ourselves to reviving and helping healthy people recover from these unforeseen instances of mild to moderate dehydration by administering intravenous (IV) hydration fluids and other stabilizing and wellness services via our mobile and brick/mortar hydration clinic to replenish your mind and body, restore you to your best self, and improve your health and everyday performance. 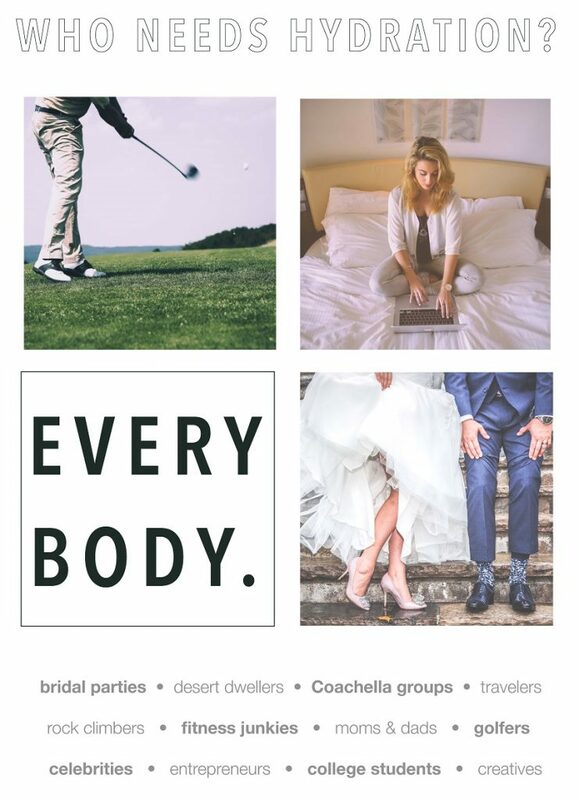 We want to be your service and facility of choice for your hydration and wellness needs not only in our state-of-the-art and tranquil IV Hydration Therapy and Wellness Clinic but also at the comfort of your own home or hotel room; your special personal events such as weddings, Bar Mitzvahs, birthdays, and other special life celebrations; public events like the infamous Coachella Festival, Stage Coach, Desert Trip, and other hot music festivals and concerts; your local bars, pubs, taverns, night clubs, dance clubs, and other entertainment venues; and immersed in sporting events at your native gym or in your football, basketball, soccer, baseball, tennis, golf practices, tournaments and games! By choosing Replenish 360, you will have full VIP access to one of the best, most professional and hygienic Intravenous (IV) Hydration Therapy and Wellness Clinic services including other point-of-care restorative and wellness amenities by our experienced healthcare professionals, licensed and certified registered nurses, dieticians/nutritionists, massage therapists, acupuncturists, fitness trainers, behavioral therapists, and health enthusiasts. Mostly, our top-of-the-line and personalized hydration and wellness facilities are for the healthy individuals who are marginally parched and desire to replenish not only their body with life-sustaining fluids, vitamins, anti-oxidants but also achieve alternative and homeopathic remedies for their minor nausea and vomiting, muscle pain/discomfort, fatigue, weight control, and stress relief just to name a few. We have a holistic and all-inclusive personalized approach to enhance your energy and beauty, improve your overall clarity, restoring you to your best self and, most importantly, improve your health and everyday physical and mental performance as the end result after receiving our exceptional and rejuvenating services. Replenish 360’s well researched and established services and products are provided by our excellent and experienced management, team members, and expert professionals with varying medical degrees able to cater to your hydration needs, can motivating you to succeed in bringing forth your best self by following our company motto passionately. We offer an all-inclusive hydration services with monthly memberships and ancillary wellness services in nutrition, massage therapy, acupuncture, personal training, behavioral therapy, lifestyle modification and other wellness strategies. We have supplementary products such as recovery drinks, vitamins, antioxidants, etc. that are accessible in our menu of hydration and wellness amenities. We want to expand serviceable areas and form partnerships with those who share similar values and code of ethics as ours. We always strive to delivery exemplary customer service to our valued guests and clients but also want to value teamwork and respect in our staff and employees. Maintaining efficiency, staying within capabilities, and be in compliance with all laws and regulations is mandated for all our staff and members. Lastly, we always want to address the feedback we receive from our guests and clients so that we delivery first-rate hydration and wellness services and be recognized in the community for our goal of improving overall health in mind and body. IV Hydration Services to the following Palm Desert area cities. Read What Patients are Saying!